Post your resume on the major job boards! This is the most passive job search method, if it can even be called a method. It requires little time or effort, but you have to do it! Who are the major job boards? Yes, there are thousands of job boards, but these are the big ones. Check out Weddles for a list of User’s Choice sites. If you are going to post your resume, it should be keyword rich for the types of jobs you are pursuing. This is not the place to post a generic resume. It WILL be overlooked. It isn’t enough to just post it and leave it. You will want/need to “refresh” it every week so it has a new date. Why? Many recruiters will search for new resumes posted or resumes freshly posted. You will want to make sure your update or post date is recent. 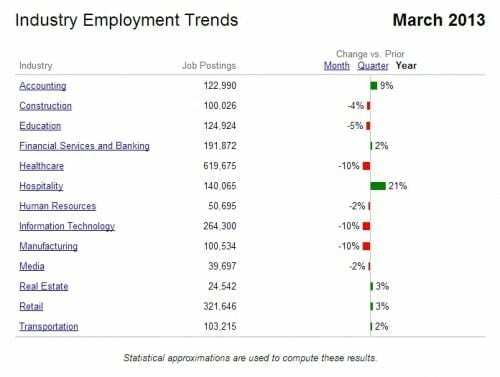 If you haven’t done research on your industry or occupation, use the job boards sites to conduct this valuable research. For example, Indeed.com shows job posting trends…don’t tell me there aren’t any jobs out there! Two year’s ago, there were 6 job seekers for every job, today. Right now, Indeed shows 1 to 2 job seekers for each job. This is SO much better. Don’t be discouraged. Get out there and pound the pavement with a purpose! Know your targets, know what they need and know what you have to offer (and I don’t mean dependability and that you are looking for a stable job).